LEN - www.lankaenews.com | President Gamarala displays his traitorous colors! Dayan to Russia despite opposition mounted an dhis putrid antecedence ! (Lanka e News -12.Aug.2018, 11.30PM) President Pallewatte Gamarala who has driven the country into an irretrievable muddle and morass by appointing misfits as foreign envoys once again demonstrated his traitorous traits when he appointed Dayan Jayatileke a notorious opportunist ,a snake under the grass and enemy of good governance as the SL ambassador to Russia yesterday (11) . Mind you Gamarala who is by now well known as incapable of doing anything good for the benefit of the country at large and therefore a foe and not a friend of the masses , appointed infamous Dayan despite tremendous opposition mounted from all quarters against this appointment. The president along with Dayan made ten appointments to diplomatic missions of foreign countries. In keeping with his characteristic incapacity to gauge what must be given priority , he failed to appoint today a High Commissioner to most important Washington , which post had remained vacant for over a year. It is well to recall when Dayan’s name was proposed to the parliament committee on high posts for the first time , the committee decided to ask from the president again due to opposition from many of its members to his appointment ,why and wherefore he should be appointed , and whether there is nobody else ? Any president with a sane mental equilibrium would not have appointed Dayan . But this Gamarala who is far fetched from sane , sensible and ethical thinking stubbornly acted like a Mule and recommended Gayan’s name again despite bitter opposition and latter’s well known putrid antecedence. On the second occasion ,Bimal Ratnayake of the JVP , , and R. Sumenthiran of the TNA the representatives of the Committee roundly opposed the appointment of Dayan as ambassador to Russia. 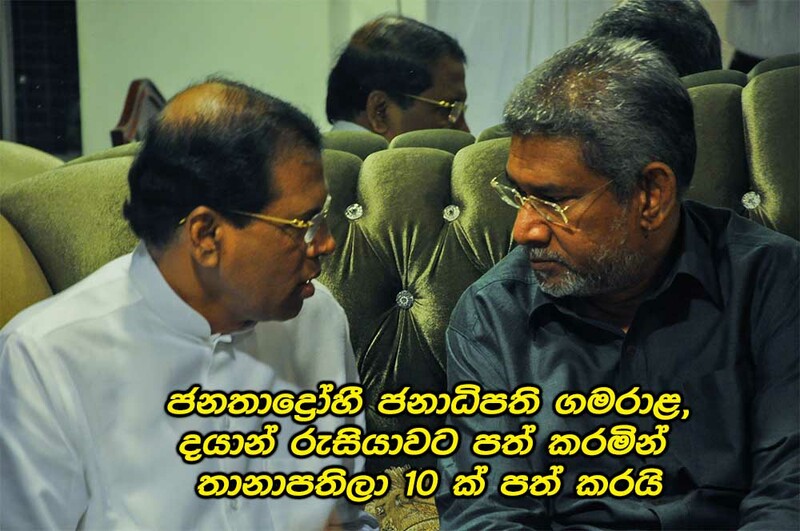 Following the opposition mounted on the first occasion , Dayan on his face book stated he can wait for another year to secure that post after talking to Mahinda Rajapakse.